Prime Location, Location 2 Bdrm, 2 salles de bain. 2 chambres, 2 salle de bains, piscine chauffée. Belle, mise à jour unité du premier étage dans souhaitable Vista Hermosa - condo Siesta Key à Sarasota. Un des plus beaux cristaux pintes plages de sable dans le monde, la clé de la sieste est définitivement un endroit pour vous de vacances. Evalué par National Geographic comme l'un des plus beaux cristaux pintes plages de sable dans le monde, la clé de la sieste est définitivement un endroit pour vous de vacances. Planifier vos vacances devrait être aussi facile et amusant que nous espérons que votre visite dans cette belle région de villégiature sera. Il ya beaucoup d'activités à choisir. 2 chambres 2 salles de bains copropriété a une scission lay-out parfait pour les enfants ou les personnes séparées. Appelez-nous dès aujourd'hui pour réserver ce pour vos vacances. Voté numéro 1 plage en Amérique par le dr. Plage. Good location. Across street from beach. Walking distance to stores restaurants etc. Condo is clean comfortable. Includes everything we needed - beach chairs towels etc. The owner was fast to reply to the initial message. Great communication at first. Big beds in guest room. Kitchen is well stocked with kitchen tools, knives and dishes. Extra towels and sheets in closet- awesome. Ice pack In Freezer - might be useful. Dining table will seat 6 people comfortably, will fit more if needed. I must note there is Play yard ( or pack-n-play) for baby. Thank you Evona!! But if you need highchair- bring your portable/ foldable one. This condo would benefit from having floors scrubbed very well. Overall- it was well cleaned. And handheld shower head in guest bathroom to shower kids easily but I guess it is personal preference. The pool is for adults. Nothing for children. The condo is located right on the Midnight Pass Blvd, and master bedroom facing the busy road, windows are very thin, more like just storm windows alone, and there IS traffic noise non stop until well after midnight. Also there is no sidewalk on the side of the Building where condo is located ( Vista Hermosa building) and there is No Crosswalks nearby, so it is very hard to cross the busy two-lane street with kids, and it is necessary to either get to the sidewalk on the other side of the road or to get to the beach. The beach is nice, white soft sand. Some shells, not a lot. It is very close to The Rock Point. The Rock Point is great for fishing. Please check NOAA site for Red Tide that may still be in August. If there will be South Wind, the beach will get Red Tide, HAB- Harmful Algae Bloom, that will cause a lot of fish to die and to wash on the shore and also will cause respiratory irritation in humans. The water will get dirty brown, there will be seaweed and dead fish everywhere in water and on the beach. Basically - no one will be able to get to the beach or in water. Our case here. Thank you Evona for letting us rent your lovely condo. We had a great holiday . 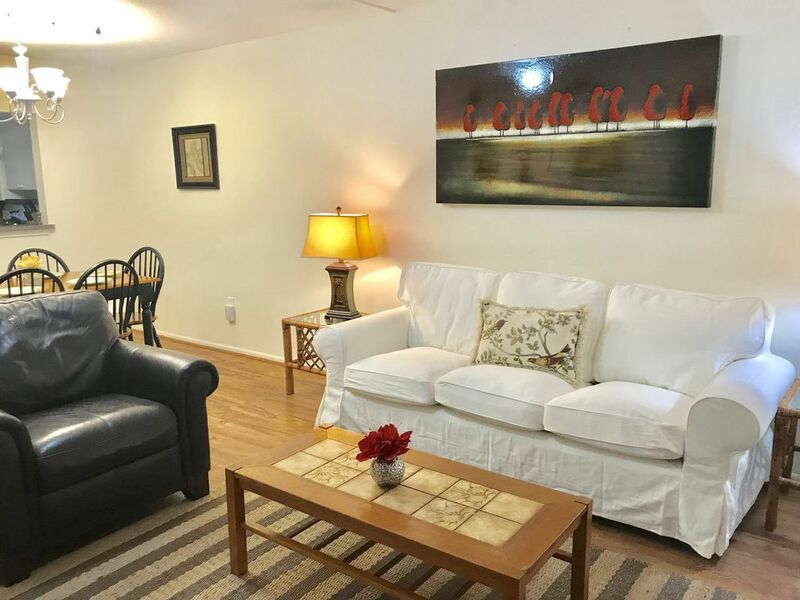 The accommodation was clean and the situation was great for getting to the local beach , although we chose to go to the main beach on Siesta Key some days . Main bedroom was adjacent to road which was noisy at night . Some parts of the property still need updating , and we chose not to use the beach chairs as they were smelly and rusty . The pool on the complex was great and everyone we met was very friendly. 2 bedroom 2 bathroom worked very well for our party . I wish my guests would let me know while staying at the property that they were not happy with the beach chairs I would be happy to supply new one. Clean, comfortable, convenient, bright and airy. Evona was extremely responsive. Really couldn’t ask for more. Enjoyed this neatly decorated condo. Siesta Key a été élu numéro 1 plage en Amérique en raison de l'expérience de plage unique. Aucune autre vacances Beach est comme des vacances à Siesta Key. * L'accès à la plage * est aussi simple que de traverser la rue et marcher à travers les stations de série sur Sarasota Cercle. · Un autre avantage est d'avoir les machines de journaux droit disponibles dans la rue et le 7/11 porte aussi le New York Times. Il est facile de louer des vélos, scooters, motos, trikes et motorisés sur la place à côté de Davidson. Ils sont très pratiques en place d'une voiture lorsque le trafic se fonde, pour ne pas mentionner son bon exercice.